Unlike some warehouse gyms, we have central air heating and air conditioning. It's a big plus on those extra hot or cold days. We are constantly upgrading and improving our facility to benefit our students. Our clean and bright facility is the perfect place for your child to grow. See and hear all the action from our spacious, comfortable viewing area. 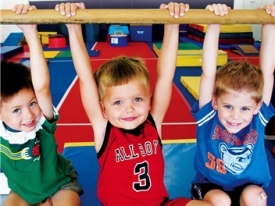 We offer gymnastics classes and tumbling classes, as well as competitive gymnastics teams. We invite you to come visit us and see our program for yourself. In the meantime, check out the pictures below. Located between the Rite Aid and Hallmark stores on Sepulveda Blvd. Walking in, you see a clean, bright gymnastics center made just for kids. Our viewing area is spacious with comfortable seating. Our students really enjoy the bars and trampolines - lots of FUN! The 2,500 springs under our floor exercise area make it bouncy and SAFE. Our balance beams of different height allow us to teach all ages & levels. We welcome you to come by and see it for yourself!